JOAKES is a collaboration between two artists – Ann Jordan and Brenda Oakes – both as old as their tongues and a little bit older than their teeth as their mothers used to tell them, who have decided that Fine Art needs an injection of humour! Between them they are on a mission to seek out the art that falls between the cracks of serious practice, dust it down, shake it up and squeeze it till its pips squeak. Today, they are carrying out a very serious experiment and hope that you will assist them. They are attempting to find out whether it is possible to create a portrait of a sitter using the third eye, otherwise known as the sixth sense or plain old intuition. Your guidance in helping them to place the marks on the paper in the right place will be invaluable in achieving this. In fact, if any marks make it to the paper, it will be considered that the experiment has been a success. JOAKES, Ann Jordan and Brenda Oakes created a small work for this establishment which subverts, with black humour, the perceived ideas of a cosy home from home ideal hideaway that offers good value for money accommodation and an experience that reflects the local culture and community. The welcoming greeting, the chocolate on the pillow, the overpowering fragrances mask an undercurrent of constant surveillance re-enforced by written and unwritten rules softened by handcrafted homilies framed on the walls. Low level noises, snatches of conversation from behind the closed door that divides the proprietor from the guest contribute to anxiety and insecurity. These are compounded by unexpected interruptions appearing from the shadows continually enquiring if everything is to the guest’s liking. The worn, much travelled suitcase becomes a repository of nightmares, experiences that have become ingrained in our psyche. The bulging staring eyes of the bowls are a constant reminder of the other within, defending their secure environment, the Bed and Breakfast establishment, from the unknown yet essential financially worthy interloper, required to keep the business viable. 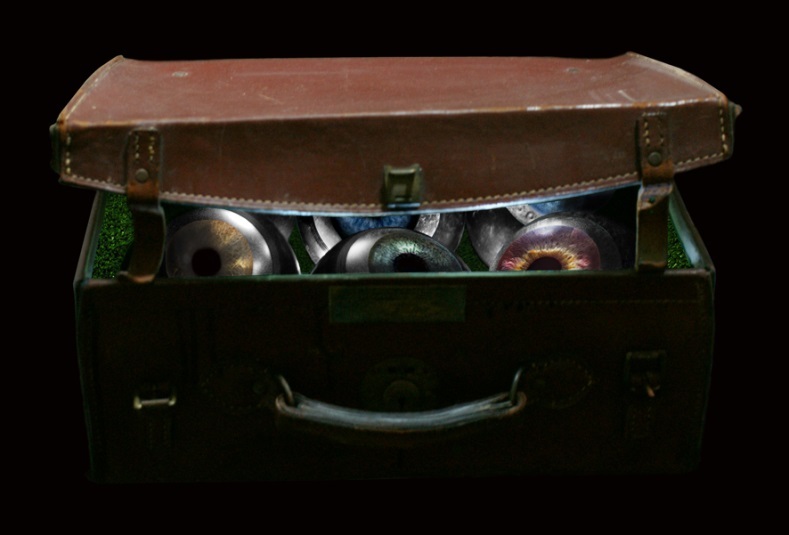 The work is created from an antique leather bowls case; the eyeballs from the bowls. It is lit internally via a number of battery operated LED lights.